I often forget I’m a blogger. I get in the middle of things and suddenly think “crap-I forget to take step by step photos”. That happens to me an extra lot when it comes to cooking in the Instant Pot….another problem, I don’t really cook with recipes. I make things up as go. I’m writing this recipe down for all of you but I’ll likely never look at the recipe again….what I have in the house for ingredients is what gets thrown in. 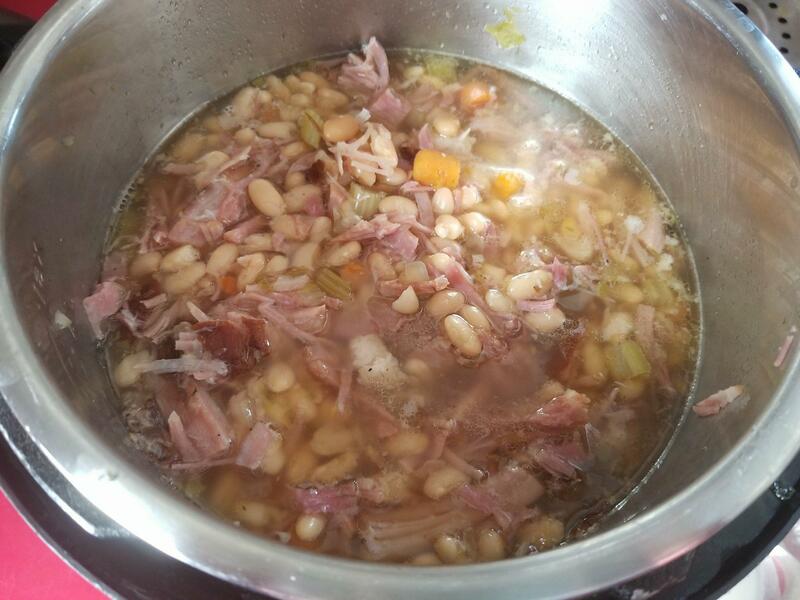 Here’s a peak at the soup all finished but let me explain my cooking…. We had left over ham in the refrigerator. It needed to get used up….so I went to the cupboard to see what kind of dried beans I had. 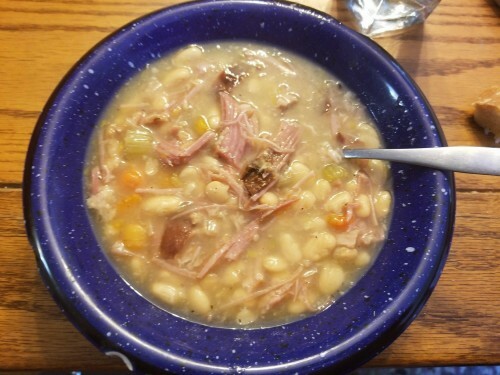 Great Northern beans are an awesome compliment to ham and I had some, so that was perfect. I put the beans and ham in the Instant Pot. I added some chopped carrots and celery (both also in the refrigerator and needed to be used) I chopped a large onion and added that too. I added salt (only a half teaspoon as the ham was salty), pepper and 2 Tablespoons of ham soup base. Then I filled the water to the 3L line….about 7 cups worth. I put the lid on, closed the release and pushed the beans button. I don’t pre-soak my beans at all. Then I went and sewed. I came down two hours later. 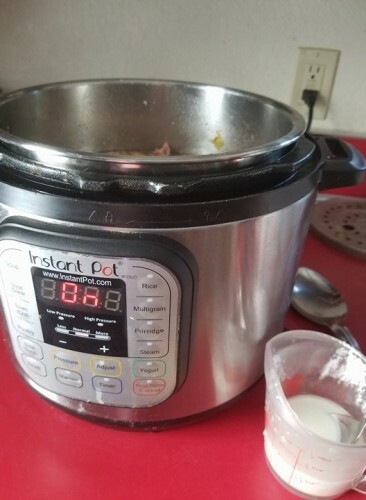 The timer had gone off and the Instant Pot had kept the soup warm. I opened it up and didn’t need to release the pressure as it had naturally released. It would have been fine with me but Hubby is not a soup lover. He tolerates it as I love it so much. Hearty soups like this I can pass by him much easier. To make it even better for him I decided to thicken the juice a little bit. I turned the Instant Pot onto saute. I mixed 2 Tablespoons of corn starch in 1/4 cup water. Then I stirred it into the soup. This thickened the liquid making the soup appear even heartier. Teasingly I told Hubby that if he dies first I am going to buy another set of 4 cup Pyrex containers and make soup and freeze it so I can pull it out whenever I want some. I told him the freezer will likely be filled with frozen soup and I’ll eat soup for most every meal from fall to summer. I also jokingly said I would love to be the soup maker for a restaurant. He laughed and said he believed me. The Instant Pot makes soup so easy. In my before Instant Pot life I would try to make soup but my busy life always had me burning it. To date, I have NEVER burned anything in the Instant Pot. If you’re looking for some good hearty comfort food for a cold day, this certainly fits the bill!